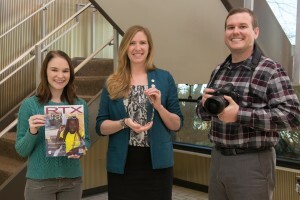 The Perspective Magazine Awards are among the highest accolades in the timeshare industry, and this year, RTX Traveler took one home for Best Print Media. We’re very gracious for the award that recognizes our hard work in bringing our customers the latest in timeshare destination exclusives. In an industry that is continuing to be outsourced and automated, we’re proud to say our magazine is 100 percent made in America with original travel content created in-house in our office in Asheville, NC. “I am so proud of our staff, and so thankful for the support we receive from our colleagues at RTX as well as our industry partners and affiliates. We love showcasing the resorts, attractions, restaurants and activities in the amazing destinations where our members travel,” said Sara Little, editor of RTX Traveler. Traveler is constantly striving to bring our readers the latest information needed for you to plan your next vacation. We receive feedback from our Travel Consultants who interact with members daily to find out the latest interest in activities and questions that might arise. We also consult with area convention and visitors’ bureaus to ensure we’re featuring the very latest in family activities in any given vacation destination. As we continue to grow, evolve, and improve our magazine, we sincerely hope it inspires you to travel to new places, and gives you activity ideas you may not have thought about.